The National Science Foundation (NSF) received close to 13,000 applications for this year’s Graduate Research Fellowship. 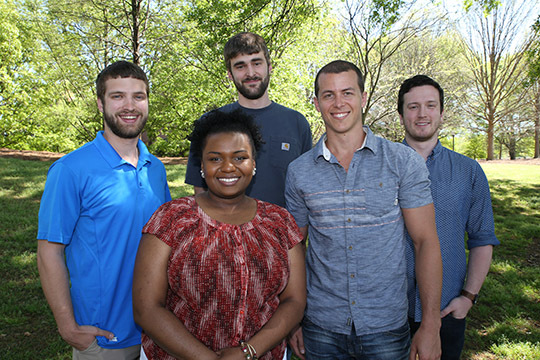 Of the 2,000 reward offers made to outstanding students pursuing research-based master’s and doctoral degrees, eight were awarded to Woodruff School students. The awards support three years of graduate study within a five-year fellowship period in research-based master’s or doctoral programs in science or engineering. The National Science Foundation Graduate Research Fellowship Program (GRFP) is the country’s oldest fellowship program that directly supports graduate students in various STEM (Science, Technology, Engineering and Mathematics) fields. As the oldest graduate fellowship of its kind, the GRFP has a long history of selecting recipients who achieve high levels of success in their future academic and professional careers. The reputation of the GRFP follows recipients and often helps them become life-long leaders that contribute significantly to both scientific innovation and teaching. The NSF notes that the GRFP "is a critical program in NSF's overall strategy to develop the globally-engaged workforce necessary to ensure the nation's leadership in advancing science and engineering research and innovation." The selection criteria used to identify NSF fellows reflect the potential of the applicant to advance knowledge and benefit society. Since 1952, NSF has funded close to 50,000 Graduate Research Fellowships out of more than 500,000 applicants. Currently, 42 Fellows have gone on to become Nobel laureates, and more than 450 have become members of the National Academy of Sciences. In addition, the Graduate Research Fellowship Program has a high rate of doctorate degree completion, with more than 70 percent of students completing their doctorates within 11 years.